Following today's event that saw the introduction of the iPhone X, iPhone 8, iPhone 8 Plus, Apple Watch Series 3, and 4K Apple TV, Apple has quietly raised the prices on all of its 256 and 512GB iPad Pro models. 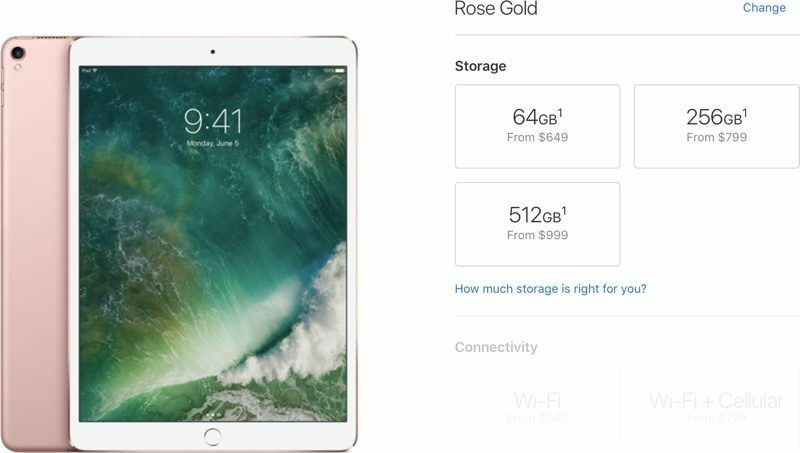 All 256 and 512GB 10.5 and 12.9-inch iPad Pro models are $50 more expensive. For the 10.5-inch iPad Pro, Apple now charges $649 for the 64GB model, $799 for the 256GB model, and $999 for the 512GB model. For the 12.9-inch iPad Pro, Apple charges $799 for the 64GB model, $949 for the 256GB model, and $1149 for the 512GB model. All cellular models are an additional $130 over the above listed prices. Prior to today, 12.9-inch iPad Pro pricing was $799/$899/$1099 for the 64/256/512GB models, while 10.5-inch iPad Pro pricing was $649/$749/$949. It is not clear why Apple has decided to raise the prices on its iPad Pro models, but prices could be increasing due to increased costs for memory. Best Buy has already updated its iPad Pro pricing to reflect price increase, but other sites have not yet done so. If you plan to purchase a higher-capacity iPad Pro, now is the time to do it at a site that still offers the original price. For the best deals, check out our Deals Roundup, which features price charts for all Apple devices, including the iPad Pro. What the hell, is this supposed to make the iPhone price increases and iPhone X price seem more reasonable? I don’t see the point in doing this, the smaller model was already $50 more than it’s predecessor. The first half of the year would suggest that Apple is stepping up its game with pricing and value, but it looks like they’ve gone backwards. Even with increased memory cost, they should keep the prices the same, margin isn’t an issue. So when the shortages pass are the gonna lower the prices? Gotta pay off that new campus somehow! This is only a very small price increase and almost certainly due to shortages of the components driving up costs for everyone. This has been a growing problem for sometime. Please don't accuse Apple of being greedy. That is not the case at all. Congratulations! You are this week's winner of the apologists award! Timmy and his margins strike again. I guess these new iPad Pro models aren't selling that well. I really hope this is going into workers wages or cost increases and not Apples bottom line at the very least. the increased costs will result in higher profits and bonus to the executives at the top. Not the actual workers that put the products together.